It would be difficult to argue against the value of having a family budget. The process of determining a family’s income and expenditures, measuring the family needs versus the family desires, making a plan to save money for a later date, all sound like wise financial moves. 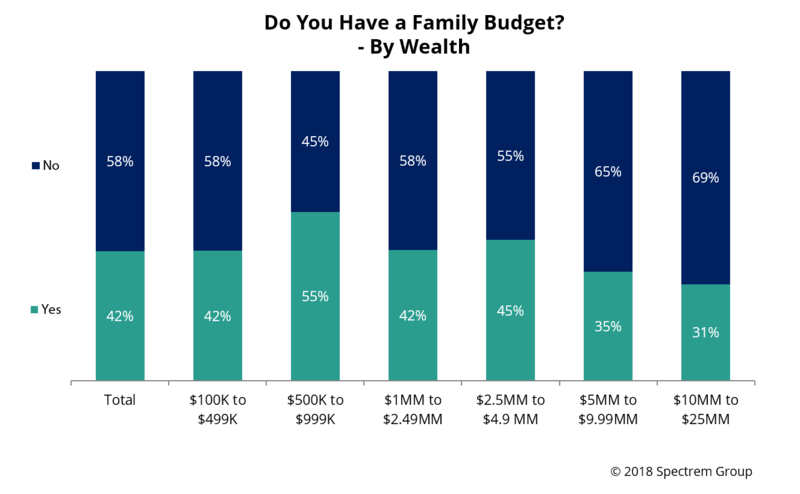 So why do so few affluent investors operate with a family budget? As part of its monthly survey of investors with a net worth of at least $100,000 (not including primary residence), Spectrem asked investors in May about their household financial planning. The results show that they don’t all operate with a household financial plan. In fact, the results show a majority of investors handle family economics without the benefit of a budget. The first question was a simple one: “Do you have a family budget?” and only 42 percent of affluent investors answered in the affirmative. The responses were segmented in many different ways, and the only segments of investors who showed at least 50 percent with a family budget were Gen X investors (53 percent), investors working in the field of Information Technology (58 percent), and those with a net worth between $500,000 and $1 million (55 percent). Is there any financial advisor who thinks it is wise to conduct family business without the benefit of a budget? Do advisors encourage their clients to create a family budget as well as a financial plan in order to provide for all of the financial needs the family has, or is going to have. The details of the survey get worse when investors with a family budget were asked to rate on a 0-to-100 scale just how well they follow their family budget. Among all investors, the rating was 68.45, which is certainly not the best possible response. The value in having a family budget comes from following it, and affluent investors are admitting it is a difficult feat to accomplish. A family budget deals with the day-to-day expenditures which occur within a household. A financial plan looks into the future, and examines an investor’s needs for education, health care and retirement planning, among other functions. Among those same investors, only 35 percent had a written financial plan prepared by a financial advisor, and that includes only 7 percent of investors from the Millennial generation. However, among those investors with a financial plan, they rated their ability to follow that plan at 71.48, showing more willingness to execute the financial plan than to execute the family budget. Is it impertinent for advisors to enquire whether their clients have a family budget? Do those clients lie to their advisor and say they do when they don’t? When the task is handling finances with an eye toward investment, it would seem wise to encourage investors to budget their daily expenses in order to have an appropriate understanding of the funds they have to invest for the future.